CASTLEKNOCK ARE INTO the last four of the Dublin SFC for the first time in the club’s history. Ciaran Kilkenny’s side are an extremely young club, having only been founded in 1998. They booked their place in the semi-finals with a convincing display at Parnell Park. Skerries Harps had rallied close to half-time and trailed by just three points at the interval, but they failed to replicate that intensity after the restart. Skerries, who had Dublin’s 2011 All-Ireland winning captain Bryan Cullen at centre-forward, kicked just three points in the second-half. Goals from Shane Boland and Mikey Galvin, along with a fine performance from centre-back Graham Hannigan, propelled Castleknock to victory. Ciaran Kilkenny’s side will make their maiden appearance in the semi-finals. They’ve enjoyed wins over St Oliver Plunkett’s/Eoghan Ruadh and St Sylvester’s already in the competition. Castleknock spent the majority of the first 30 minutes sitting deep and opting to attack in numbers on the break. Castleknock’s system paid off on 17 minutes, when they halted a Skerries attack and counter attacked at pace. Shane Boland finished off the move by firing into the net from close range to give his side a 1-3 to 0-2 lead. A couple of Des Carlos frees left Castleknock six in front, but then came Skerries’ purple patch. Four straight scores, including three from the boot of 2015 Dublin minor Steven Smith, launched them right back into contention as Castleknock found it difficult to retain possession past midfield. Graham Hannigan kicked excellent point for Skerries after a surging run forward. Then, in stoppage time, Morven Connolly denied Skerries a goal with a fine save from Graham Cullen. Castleknock led by 1-6 to 0-7 at the break. The margin didn’t move much in the third quarter as Castleknock maintained that three point cushion. Then Kilkenny kicked a sublime score from the left wing, when he jinked onto his right and slotted over. Carlos clipped one over moments later, and to send Castleknock found themselves five ahead. The key moment of the game arrived midway through the second-half. Another swift Castleknock breakaway culminated in Shane Boland slipping through Mikey Galvin, who finished past Shane Davis. Colin Lynch, Carlos (free) and Galvin all tagged on scores as Castleknock extended their lead. Scorers for Castleknock: Shane Boland 1-2, Des Carlos 0-6 (0-5f), Mikey Galvin 1-2 (0-1f), Ciaran Kilkenny and Colin Lynch 0-1 each. Scorers for Skerries: Steven Smith 0-8 (0-6f), Mark Boylan, Bryan Cullen, Graham Cullen 0-1 each. Subs: Colin Lynch (for Matt Griffin, 32 mins), John Kindlon (for Kevin Kindlon, 41 mins), Paul Bourke (for Colm Neville, 49 mins), Tom Corcoran (for Des Carlos, 55 mins). Subs: Jonathan Garrett (for David O’Brien, 25 mins), Donal McIlgorm (for Mark Boylan, 41 mins), Gerard Daly (for Graham Gilmore, 49 mins), Barry Davey (for Paul Cashman, 55 mins), Conor O’Brien (for Colin Daly, 55 mins), Robert McKey (for Sean Rocks, 60 mins). Email “Ciaran Kilkenny's Castleknock into the last four in Dublin for the first time in their history”. 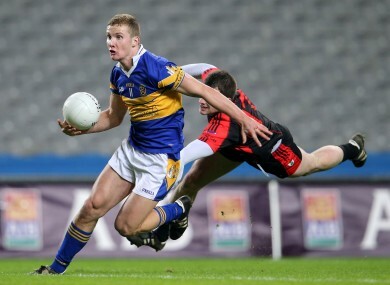 Feedback on “Ciaran Kilkenny's Castleknock into the last four in Dublin for the first time in their history”.